A reminder that if you have opted-in to the British Tennis Wimbledon ballot, the Club will be holding its ticket draw next Friday. The bar will open from 7.00pm and there will be a few nibbles and snacks available. The draw will take place at 8.00pm. The Club has received 23 pairs of tickets, and remember that if you attend on the night you get to select your tickets if drawn out. Toby or I can also give you more details, or just come along on the day. Bill has been coaching tennis for over 25 years, including 15 years at Sydenham Tennis Club. Bill looks after the Beginners group club play sessions on Wednesday evening and Sunday afternoon. This suits Bill’s philosophy of tennis for all and ‘always try your best’. Next week… the Bar/Reception team. The following events are in competition this year – Men’s Singles, Women’s Singles, Men’s Doubles, Women’s Doubles, Mixed Doubles, Over 40s Mixed Singles, Over 55s Mixed Singles, Improver/Intermediate Mixed Doubles, Beginners Singles, and Beginners Mixed Doubles. There is no fee to enter, but you can only enter a maximum of four events. Please note that for all doubles events you can enter with a partner, or put ‘partner required’ and we will allocate a partner. Entries will close on 30 April 2019, and the draw will be made in early May with matches commencing shortly afterwards. Finals Day is scheduled for Saturday 14 September 2019, so please make sure you are available on this day before entering. All Finals are held on this day without exception! If you have any questions about the tournament, please contact me at dez.lewington@sltcc.co.uk. The new croquet season has started and there is an Open Day this weekend for anyone wanting to try out the game. It’s quick and easy to pick up so why not give it a go!? Contact Jane Sheridan at croquet@sltcc.co.uk for information or come along on the day. Appropriately then, we should meet the principal members of the Croquet committee this week. Jane Sheridan is Chair and can be contacted at croquet@sltcc.co.uk; Liz Price is membership secretary on 07915 543048; and longstanding club member Michael Wheeler will help with coaching matters at croquet@sltcc.co.uk. Next week… Bill Buah from the Tennis coaching team. There are a few places remaining on tomorrow’s Camp if you have nothing planned! It’s a full day of coaching, matchplay and tactics with both Toby and Toussaint. Cost – £40.00 – book your place here. The Annual Racketball Finals take place this weekend, starting at 1.30pm. There are eight players remaining from the qualifying event that began in January. If you’ve never played, this would be a good opportunity to watch some matches and learn about the game. 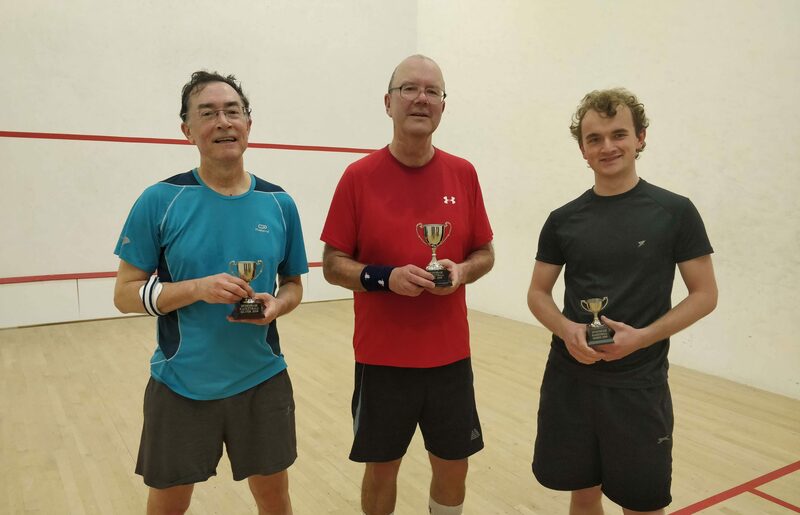 This event is also a last hurrah for David Roberts, who is retiring from leading the Racketball section after many, many years – although we will still see him on court! Toby and Toussaint will be running another full day of coaching, matchplay and tactics. Geoff has been Head Groundsman since retiring as a Building Control Surveyor nine years ago. He is ably supported by Paul who together form the Grounds team. You may not be so familiar with them unless you are at the Club daytime during the week, but you will have benefitted from their work. We are fortunate to have lovely grounds to play in and keeping the grass, hedges, trees in trim, as well as clearing and maintaining the tennis courts takes a lot of work! Next week… the Bar Committee. The Club runs Singles leagues all year round, with each cycle lasting approx eight weeks. Mixed for men & women, Women only and Off-peak leagues are offered, and there are currently 86 participants. Here is a list of the Winners from the most recent round. Congratulations to all the above – and perhaps it will inspire more of you to play! The current round will end on 15 May 2019. If you have any questions about the Singles leagues, or would like to join next time, please contact me at dez.lewington@sltcc.co.uk. For the first time, the Club will be operating a small pro shop for equipment & accessories. We have negotiated a supply deal with Tecnifibre, who are a top brand in both Squash and Tennis. Demo rackets will be available to try before you buy and will be on sale at a discount to the recommended retail price. There will also be a full range of accessories for sale, such as balls, grips, caps, sweatbands, etc. The Pro Shop will launch with an Open Day on Saturday 6 April between 1-3pm, so if you are looking for a new racket for this Summer come along. I’ll be in the clubhouse to answer any questions and show you the rackets. For more information about opening hours and what’s available, please see the displays in the clubhouse foyer and outside the Club Manager office. Wayne Evans will be a familiar face and well known to many of you already. Apart from a short time working away from London he has been a member for almost 20 years. For much of that time he has provided grounds & maintenance services to the Club. Within the last year or so he has taken tennis coaching qualifications and supports both Junior & Improver/Intermediate club play on Wednesday evening. He also provides a tennis racket stringing service. A newly revamped club night will start again on Thursday 4 April from 7-9pm. Pete Edwards will now be supported by John Rowe and Anthony Burgis, in order to make club night a more permanent fixture on the calendar. Club night will include both matchplay and coaching on some occasions, and remember that free lighting is provided too! So please support the evenings to make them a success, and if any members can help run club night that would be very welcome. The current round of the leagues ends on Sunday 17 March. Please email me no later than Monday 18 March if you would like to join for the next round. Apart from the main Mixed singles league, there are also a separate Women’s league and an Off-peak league. Katharine Beaudry is Chair of the Tennis Committee, which meets every other month to discuss matters relating to the Tennis Section. For example, at the last meeting the following was talked about: entering Junior teams in the Summer Kent leagues and guidelines for parents involved; the roles of each member of the Committee; the introduction of a ProShop for rackets and equipment; clay court etiquette; and issues around Team Training. The next meeting is on 18 March, so if you have anything you would like to raise, please contact any member of the Committee before then – a list of members is in the clubhouse foyer. Next week… Wayne Evans.